It’s late September 2001. Masaru Oshiro stands on a temporary platform overlooking still-smoldering Ground Zero in New York City. With him are a dozen relatives of 9/11 victims. Most are crying, trying to understand why their loved ones died. Oshiro and his American Red Cross crisis counselors are prepared with tissues, bottled water and caring hearts. "If they want to talk, cry, grieve, we’re there for them," he says. The mother of a fallen fireman, still unable to accept that her son is missing, tells Oshiro about her son’s trip to Hawaiʻi and other trivia. "She is holding on to the real grief inside," explains Oshiro. "We need to understand that, allow her level of expression, and she may eventually reveal deeper feelings, which she does. Our job is to give psychological first aid." 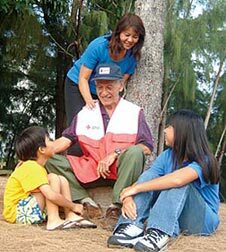 The soft-spoken Oshiro has served as a Red Cross disaster response mental health field supervisor since retiring, in 1995, as deputy director for the Hawaiʻi Department of Health. Red Cross duty is the latest in a long line of public service roles that include chair of the Hawaiʻi Board of Paroles and Pardons, acting administrator for the state Medicaid program, president and CEO of Alu Like and executive director of Queen Liliʻuokalani Children’s Center, where he supported the production and publication of Hawaiian historian Mary Pukui’s Nānā I Ke Kumu (Look To The Source) to help Hawaiians cope with stressful cultural conflicts. Not a bad record for a plantation worker’s son from Waipahu whose teenage years were marked by the curfews, blackouts, rationing and racial discrimination that followed the Japanese bombing of Pearl Harbor in 1941. Oshiro graduated from high school in 1946 and immediately joined the Army. "Not something a number one (and only) son of an Okinawan family is supposed to do," he admits. "Too risky. But I just wanted to grow up, move away from home and get life adventures. The 442nd folks were my heroes." After a tour of duty in postwar Japan, Oshiro enrolled at Mānoa thanks to the G.I. Bill. He gravitated toward social work, perhaps because of the suffering he witnessed at Hiroshima, he reflects. And he volunteered as a Red Cross case aide, assisting families of Korean War veterans. The Red Cross sent Oshiro to Long Island, N.Y., following the 1996 crash of TWA flight 800; to California’s Central Valley after flooding in January 1997 and to the crash site of Korean Airlines flight 801 on Guam seven months later. In Guam, he says, "tears were forming in our eyes when we saw children and families screaming and wailing in the full cultural expression of their grief." The second-generation bilingual Koreans Oshiro’s team recruited as translators "over-identified with the folks from Korea," he says. "We had to debrief them. It was very challenging work." He also recalls debriefing divers, Coast Guard and other recovery personnel at the TWA crash site. "They’re looking at dolls, a child’s backpack in the debris," he says. "Some of these folks have children, and it really affected them. We had to make sure they didn’t overextend themselves." Closer to home, Oshiro is called to the scene of shootings, domestic violence, house fires and hostage situations. He makes sure coping mechanisms and support networks are in place for people suffering from trauma. It’s serious work, but Oshiro has a lighter side, according to daughter Leah Chang. "As a dad he was strict but fun," she recalls. "He taught us how to ride a bike, took us to Honolulu Stadium for baseball games and built us a tree house." He also taught Leah and brother Willis about helping others. "There were times he brought runaways or other clients home and we had to vacate our bedrooms for them. So when you live that, it instills in you what a good thing helping is." It also guides a career choice. Leah graduated from Mānoa with a master’s in social work. Like her father, she works with the Department of Health, as a mental health supervisor in the Child and Adolescent Mental Health Division’s Central Oʻahu Family Guidance Center. She assisted traumatized witnesses in 1994 when the elephant, Tyke, killed a trainer during a circus performance at Neal Blaisdell Center and then was gunned down by police in Kakaʻako. She helped parents and children on Kauaʻi cope after Hurricane ʻIniki wreaked havoc with their lives. And, like dad, she is a Red Cross volunteer. After all, helping is a family legacy. Oshiro’s mother, Yoshi, who recently turned 102, spent 25 years as a foster grandmother at Waimano Home for developmentally disabled children. "That’s three generations of our family providing service to others," Oshiro says with pride. The UH Mānoa School of Social Work celebrated its 70th anniversary in November 2006 by honoring five social workers for their remarkable contributions to Hawaiʻi. Besides Masaru Oshiro, alumni honorees are Haunani Apoliona (MSW ’76), a leader in the Native Hawaiian community; Ah Quon McElrath (BA ’38), architect for social justice and former UH regent, and Richard (MSW ’62) and Lynette (MSW ’66) Paglinawan, Native Hawaiian cultural practitioners and community leaders. The school also acknowledged Patti Lyons, a lifelong advocate for children in need. The celebration was in keeping with the school’s mission to generate, share and apply knowledge that benefits Hawaiʻi. UH first offered social work courses to agency employees who lacked professional training in 1936. A one-year program of graduate study launched in 1940 formed the basis for the two-year MSW program, first accredited in 1950. Bachelor’s and doctoral programs were added, and enrollment grew from 30 to an average of 300 today.